The image that instantly comes to mind at the mention of a pear is a distinctive shape, color and scent — the familiar contours of a gold-green Bartlett. Many varieties of pear trees are native to parts of Asia and Europe, but how and when did the Bartlett come by its name and earn its popularity in the new world? It’s quite a story! 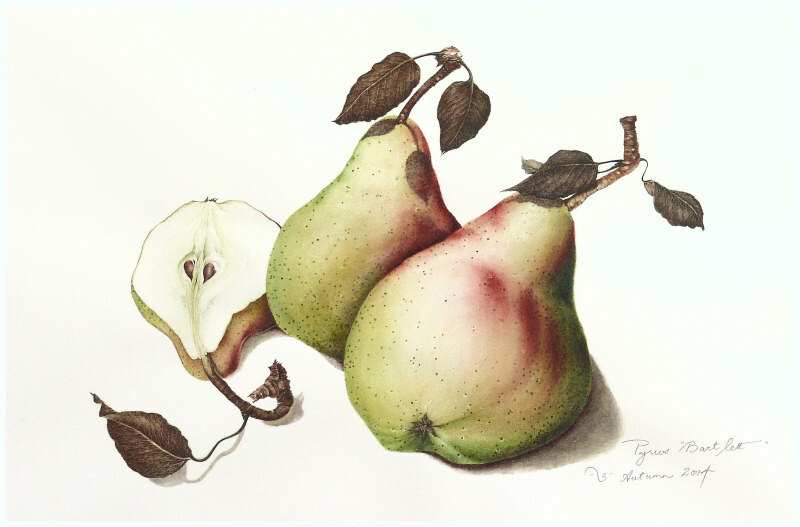 In 1765 a Mr. Stair, an English schoolmaster, first identified a variety which came to be known as Stair’s pear. Then a nurseryman named Williams introduced it to the rest of his country as Williams’ Bon Chretien and folks began calling it Williams’ good christian. Decades after, in 1799, James Carter imported trees from Williams to the U.S. to be were planted in Thomas Brewer’s estate in Roxbury, Massachusetts. This estate was eventually acquired by Enoch Bartlett who propagated and introduced the variety to the U.S., giving it his own name, quite unaware of its previous history. It was only in 1928 when a new batch of trees were again imported from Europe that people realized the Bartlett and Williams were the exact same pear! © 2008 – 2010, milly acharya. All rights reserved.